The feet's important function is to act as shock absorbers whilst walking and running. With the flat foot disorder, the schock-absorbing mechanism is impaired, and may cause not only pain in the foot, but also in the ankles, knees, hips, back, and even headaches. Caring for your feet is essential to your well-being. Small problems with your feet can be fixed efficiently and quickly by your podiatrist. In the mean time, here is information about common foot disorders, their symptoms, causes, and how your podiatrist cures them. DEFINITION – Achilles tendonitis is an inflammation due to overstressing of the Achilles tendon. This tendon (also called “heel cord”) runs from the heel to the calf muscles. It is the thickest and strongest tendon in the body needing sometimes to withstand up to 12 times a person’s body weight. Achilles tendonitis is a soreness and stiffness that comes on gradually and continues to worsen until treated. swelling and limited ankle flexibility. The Achilles tendon will feel sore when lightly pinched between the forefinger and the thumb. It is a common injury amongst middle and long distance runners. Repeated or continued stress on the Achilles tendon increases inflammation and may cause it to rupture. Partial or complete rupture results in traumatic damage and severe pain, making walking virtually impossible and requiring a long recovery period. Excessive pronation: when walking, many people have their feet rolling in (pronating). This causes the arch to collapse, and the heel bone to roll internally. The Achilles tendon is therefore stretched sideways instead of in a straight direction, which puts much stress at the point where it attaches to the heel. Inappropriate footwear (high heels which shorten the tendon). Physical activity that produces the symptoms should be discontinued. If pain develops even with proper stretching and training techniques, the patient should consult a podiatrist to check for excessive pronation and the prescription of custom orthotics (also called “arch supports”) which will give controlled support to the arch and hence neutralise abnormal foot pronation, maintain good foot alignment and eliminate pain. The amount of support necessary will differ from one person to the other and a podiatrist will be best able to measure the exact amount of support necessary for each individual. If necessary, the podiatrist may prescribe a small heel raise to temporarily help take the pressure off the heel bone. Orthotics need to be worn between 75 and 80% of the time when weight bearing, to be effective. Prevention is best achieved with checking for pronation, an overall good shape, effective warm-ups and stretches before exercise. Learn more about orthotics on the orthotics information page. For any questions about achilles tendonitis, orthotics, or our treatment procedures, give us a call. In certain cases, back pain essentially occurs because of a poor position of the joints, from the feet up. Flat feet are therefore the main factor. Flat feet or 'over-pronation' occurs when the feet roll in so that the arches are turned closer to the ground. This incorrect position of the joints of the feet and ankles causes the lower leg to rotate internally. As a result, the pelvis is forced to tilt forward, which can cause an increased curvature of the lower back. Especially after standing up-right for longer periods the curvature in back will cause tightness and stiffness of the lower back muscles. In time, the hurtful position of the joints can also cause inflammation and pain. Back pain can be cured and prevented by correcting the movement of the knee cap, pelvis, and therefore, spine. Your podiatrist will do this by supporting the feet with a type of insole called 'orthotics' into a normal, aligned position, and the re-alignment of upper joints in the leg, pelvis, and back will subsequently follow. DEFINITION – A bunion is a protuberance of bone or tissue around a joint, usually at the base of the big toe but can also occur at the base of the little toe (“bunionette” or “tailor’s bunion”). It is often associated with the big toe deviating at an angle (“Hallux Valgus”) and a widening of the angle between the 1st and 2nd metatarsals (long bones which connect to the toes). Bunions are often painful to various degrees and the skin and deeper tissues around a bunion can also be swollen, red or inflamed and painful. Because of the big toe pushing in toward the lesser toes, the other toes can be indirectly affected by a bunion: the smaller toes may overlap, develop corns and become bent and toenails may begin to grow into the sides of the nail bed. Some bunions are caused by arthritis or trauma (fractures or breaks into the joint). Footwear is not the common cause as generally promoted but is only a contributing factor: when wearing high heels, the person’s weight is not distributed over the whole foot but nearly only over the ball of the foot and especially on the big toe. Women tend to develop bunions more than men because proportionally their feet have to carry more weight than men. Similarly, overweight people will more easily develop bunions. Bunions can run in a family but are not hereditary as it is the biomechanical structure that is hereditary and passed through the family. Bunions cannot be reversed, except through surgery. They can only be relieved by custom orthotics (also called “arch supports”) which neutralize abnormal foot pronation and reduce the load on the forefoot area. Proper weight distribution and biomechanical activity are re-established which may prevent or reduce the gradual growth of a bunion. Sometimes surgery (“bunionectomy”) may be indicated when a bunion is at a tertiary stage, however, custom orthotics must be worn after surgery to prevent any reoccurrence. For the custom orthotics to be effective, it is necessary to wear them between 75 and 80% of the time when weight bearing. For any questions about flat feet, orthotics, or our treatment procedures, give us a call. DEFINITION – Metatarsalgia (pronounce "Met-a-tar-sal-jia") is pain in the ball of the foot, the area just before the toes. It is a common disorder that causes a burning sensation, a bruised feeling and generally speaking pain over the whole area of the ball of the foot. Sometimes a callous develops in the centre of the ball of the foot and footwear may wear out in a similar spot. Commonly associated with Metatarsalgia, is Morton’s Neuroma. The symptom of Morton’s Neuroma is a localized pain in the ball of the foot, between the 3rd and 4th toes. It can be sharp or dull, and is worsened by wearing tight fitting shoes and by weight bearing. Morton’s Neuroma may also cause numbness, tingling and discoloration of the 3rd and 4th toes (lesser toes). CAUSES – Metatarsalgia commonly occurs from rolling in of the foot (“excess pronation”) along with rotation and dropping of the bones between the arch and the ball of the foot (“metatarsal bones”) resulting over time in weakening of the soft tissue structures (ligaments and muscles), causing pressure and pain. In the Morton’s Neuroma, the 3rd and 4th metatarsals pinch the nerve running between them, causing the pain. Custom orthotics also called “arch supports” will very effectively treat Metatarsalgia and Morton’s Neuroma by preventing excess pronation, realigning and lifting the bones of the ball of the foot to their neutral position and maintaining them there. The amount of correction necessary will differ from one person to the other and a podiatrist will be best able to measure the exact amount of correction necessary for each individual. The patient will also be instructed to wear shoes with wide toe boxes and avoid shoes with high heels. In the beginning, when wearing the orthotics, the muscles and ligaments of the feet and whole body need to get used to the new correct position of the feet. To do this smoothly, the wearing time of the orthotics needs to be gradually increased over a 1 week period. Orthotics need to be worn between 75 and 80% of the time when weight bearing to be effective and it will take approximately 3 months for the body to be fully used to the new correct position of the feet. Learn more about orthotics on the orthotics page. For any questions about ball of foot pain, orthotics, or our treatment procedures, give us a call. Callous is a patch of abnormally hard and thick skin, usually on the hands or feet. It forms as a natural reaction to repetitive friction and pressure, producing this hard protective surface. But when it forms in bulk and excessively thick quantities, callous may cause pain when pressure is applied. Callous will only begin malforming if the feet undergo unusual pressure from flat-foot or high arches, or from badly fitting footwear. Your prodiatrist will therefore treat this disorder by correcting the position of the feet with prescribed insoles called 'orthotics' or healthier footwear, in order to cancel the abnormal walking movement. Orthotics provide support for the foot at all times and re-align and re-balance the joints of the foot into a natural position. Your podiatrist will also remove the callous by gently and painlessly paring the hard dead skin away with a scalpel, until the skin returns to a normal and comfortable thickness. For any questions about callous, orthotics, or our treatment procedures, give us a call. DEFINITION – Also known as children’s heel pain. It most commonly affects children and teenagers between the ages of 10 and 14 years. Affected children will complain about pain at the back, side or underpart of one or both heels upon walking or standing and sometimes after sporting activities. Pain is alleviated when walking on the toes. CAUSES – Between the ages of 8-14 years, children’s bones are still in the growth stage. The end of the heel has “growth plates”, i.e. cartilage that will ossify (turn into bone). The Achilles tendon is attached to this heel bone. Sever’s disease occurs when damage or a disturbance in the area of growth of the heel bone appears. “excessive pronation”: when walking, many people have their feet rolling in (pronating). This causes the arch to collapse, and the heel bone to roll internally. The Achilles tendon (heel cord), which is inserted into the heel bone, is therefore stretched sideways instead of in a straight way, which puts much stress at the point where it attaches to the growth plate. an imbalance of growth spurts in soft tissue and osseous growth. overuse or repeated minor trauma happening with a lot of sporting activities. Cutting back on sporting activities, as often recommended by doctors, will help in the short term to alleviate the symptoms, but for long term relief from Sever’s disease, consulting a podiatrist is essential. Neutralising abnormal foot pronation with the help of custom orthotics also called “arch supports” works very well with Sever’s disease. As their name indicates, they support the arch, preventing it from collapsing and hence stabilizing the foot and the heel bone and its growth plate. If necessary, the podiatrist may prescribe a small heel raise to help take the pressure off the heel bone. Orthotics need to be worn between 75 and 80% of the time when weight bearing to be effective. Learn more about orthotics on the orthotics page. DEFINITION – Also known as children’s knee pain. It most commonly affects young people, particularly boys, between the ages of 8 and 15 years who play games or sports that include frequent running and jumping. It is a common form of “growing pain”. It is characterised by swelling and enlargement of the tibial tubercle, a raised area just below the kneecap, especially painful when pressed. The hinge motion of the knee is not affected. “excessive pronation”: when walking, many people have their feet rolling in (pronating), which causes the tibia (shin bone) to rotate internally. At the level of the tibial tubercle, the kneecap tendon is pulled sideways instead of in a straight way, which puts much stress at the point where it attaches to the bone. As these three conditions occur, disruption of the tibial growth plate takes place (part of the shin bone which, because the child is still growing, is made of cartilage which will slowly turn into bone) and the child or teenager will experience secondary swelling and pain. 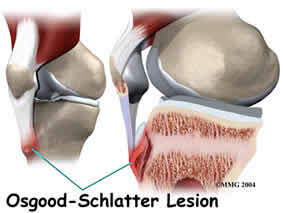 Osgood-Schlatter lesion may be temporarily relieved by anti-inflammatories and rest from sport activities, as often recommended by doctors, but consulting a podiatrist is essential to treating the problem. Neutralising abnormal foot pronation with the help of custom orthotics also called “arch supports” works very well with Osgood-Schlatter lesion. As their name indicates, they support the arch, preventing it from collapsing and hence preventing the foot and the shin bone from rolling in. This in turn reduces the tractional forces placed on the knee joint and growth plate of the child. Orthotics need to be worn between 75 and 80% of the time when weight bearing, to be effective. Learn more about orthotics on the orthotics information page. Corns are simply areas of callous which have become moulded into a thick and hardened nucleus. Inside a corn is a cone-shaped core, the point of which can press on a nerve, hence causing pain. There are hard corns which occur on the dorsum or on the tip end of toes as well as on the plantar surface of the foot. Soft corns are always found between the toes. They result from bony prominences and are soft due to perspiration in the forefoot area. All too often hard and soft corns are caused by tight fitting shoes, high heels, deformed toes or the foot sliding foreward in a shoe that fits too loosely. Basically a corn is a reaction of the derm or skin, to stress in a very defined area and is always indicative of concentrated pressure in a specific site. Seed corns are different. They are simply hard beads or plugs of cholesterol and they have no surrounding callous. They appear only on the sole of the foot regardless of pressure from a bony part of the foot and are frequently found in non-weight-bearing areas. They may single or multiple. The best way to prevent hard and soft corns is to wear properly fitted footwear. The toe box should be high and wide enough so as to not squash or squeeze the toes. Shoes that are too tight or too loose need to be avoided. Orthotics will help absorb shock and distribute pressure equally over the whole foot. Your podiatrist can of course gently pare back the offending corn but without these preventative measure, corns will inevitably reappear. For any questions about corns, orthotics, or our treatment procedures, give us a call. DEFINITION and CAUSES – Diabetes mellitus is a serious chronic disease, generally defined as excessive glucose (sugar) in the blood. When diabetes is present, either the body produces less or no insulin (Type 1) or the body tissues are resistant to the effects of insulin (Type 2). Insulin is a hormone that helps the body deal with sugar (glucose) in the diet. Diabetes therefore results in higher levels of glucose in the blood, which can damage a whole range of body tissues and organs. nerve disease or neuropathy (loss of sensation), which impairs sensation to the feet. This means that a diabetic will no longer feel the pebble in his shoe or the corn between his toes. This in turn can lead to injury, ulceration and infection. hypertension and peripheral vascular disease among others, leading to reduced blood supply. This “poor circulation” means that the healing rate of skin or ulcers will be slower. CARE – Ulcers need to be taken very seriously and treated promptly as they can otherwise become infected and ultimately lead to amputation in diabetics, whereas with proper care they are totally preventable. Regular visits to a Podiatrist are paramount. 15 % of all people with diabetes will be affected by a foot ulcer during their lifetime. Up to 85% of all amputations in relation to people with diabetes are preceded by a foot ulcer. 50% of the 2800 non-traumatic amputations that occur in Australia each year are done on people with diabetes because of poorly controlled diabetes! Protect their feet from injury by wearing well-fitting shoes (soft, deep enough and broad enough,) by never walking barefoot and always wearing socks with shoes. Shake out their shoes before wearing them. Inspect their feet daily (a podiatrist can show how). See a podiatrist every 3 to 6 months for a foot assessment and to assist with corns, callouses and any nail problems or if a wound or cut is not healing. Cut toenails carefully straight across and never cut into the corners to avoid ingrowing toe nails; use an emery board or file on sharp corners. NEVER use commercial corn cures. See a Podiatrist for corns or callous. Podiatrists have a very important role to play in the prevention and management of complications of the foot in those with diabetes. Regular foot care from a Podiatrist is a key way to prevent problems from developing in those who are at risk. When something does go wrong, see a Podiatrist immediately. Waiting a "few days to see what happens" may be the difference between a good and poor outcome. The sooner treatment is started the better. Flat feet or the lack of an apparent arch when standing, may be genetic or due to lax ligaments in the foot. Children until the age of 3 do not have arches and always look as if they had flat feet. For some people with flat feet, this is just the shape of their feet. It just runs in the family. For others, flat feet develop later in life, due to arthritis, an injury or a ruptured tendon of the foot. For others again, flat feet may be due to a loose ligament the the heel joint (subtalar joint) or at the base of the big toe. Rolling in of the foot is called "pronation" and since the feet of these people roll in more than normal, they are said to be "over-pronating". Long-term over-pronation can easily lead to Arch Pain, Plantar Fasciitis, Heel Spurs, Bunions, Knee Pain, and/or Back Pain. Flat feet are therefore guilty of causing the majority of skeleto-imbalance-related ailments, since the feet are the foundation of the body, and just as in constructing a building, when the foundation is imbalanced, so will the rest of the framework. The effects of flat feet develop slowly, and result from flat feet's long-term damage on the body's joints. Some lucky people with flat feet never will suffer any discomfort at all. However for those who do, walking can become awkward and painful. Orthotics, especially if they are custom-made, will provide correct support to the arch of the foot and medial rearfoot posting at all times and prevent the rolling in of the foot. Orthotics provide support for the foot at all times and re-align and re-balance the joints of the foot and higher joints of the knees, pelvis, and spine into a natural position. By encouraging a more comfortable and correct position of the body's joints, the orthotics therefore cure a vast range of foot problems that occur because of a damaging position of the joints. See what orthotics can do for you by visiting the orthotics page. Fungal infections are extremely common on the skin of the feet and can also invade the nails. Boots and closed in shoes create the necessary conditons of moisture and warmth between the toes making it easier for fungal infections to spread, especially when public swimming pools and showers are used since fungal infections are highly contagious. The clinical diagnosis of a fungal infection can be confirmed by microscopic examination of skin or nail scrapings and the type of fungus can be identified by culture of the scales. Treatment can be difficult and lengthy, so it is a good idea to try to prevent the infection by taking some simple measures. This type of fungal infection causes red, dry and flaking skin and can sometimes be painful or itchy. It occurs mainly between the toes or on the soles or sides of the feet. But the fungal spores can also spread to other parts of the body such as the groin or the underarms. Prevention of Athlete's foot is possible with careful foot hygiene. Thorough daily washing of the feet and careful drying, especially between the toes is essencial. Also important, are the wearing of dry airy shoes and socks and the use of foot powder. It is also recommended to not borrow footwear from others and to wear protective shoes when using public showers or pools. In order to clear an existing infection, your pdoiatrist will recommend a general topical treatment to be used twice daily. If the infection becomes chronic, an oral anti-fungal medication may be necessary, and very strict foot hygiene will have to be followed. This type of fungal infection is rare in children but very frequent with adults. All that is needed is a small entry point for the microscopic fungi such as a small trauma in the nail. From then on, the infection will more than likely grow and spread thanks to the ideal warm and moist conditions in the socks and shoes. The infected toenail will start to thicken or to crumble. It will change colour to a yellowish, brown or white colour. Streaks or spots may appear. It is a difficult and lengthy condition to treat. Toenail infections may take more than 18 months to clear as the drug is incorporated only into newly formed nail. A higher success rate will be achieved through oral medication rather than topical applications. Until the infection has been cleared, the infected person should not go barefoot in places where they would expose others to the fungi, i.e. changing rooms and public swimming pools or showers and should not allow anyone else to used their towels, shoes and socks. A non-absorbent bath mat should be used and cleaned with disinfectant. Anti-fungal powders or sprays should be used regularly inside the shoes. For any questions about toenail fungus, athlete's fungus, orthotics, or our treatment procedures, give us a call. DEFINITION – Plantar Fasciitis is an inflammation of the Plantar Fascia. The Plantar Fascia is a ligament that runs on the bottom of the foot connecting the heel bone to the ball of the foot. It supports the arch and can become inflamed due to excessive stretching. This common foot pain is often felt near the inside of the foot where the heel and arch meet. The pain is often acute first thing in the morning after getting out of bed or after a long rest and tends to subside within a few minutes of weight bearing. Often the pain is described as “moving around”. CAUSES – Plantar fasciitis is generally due to walking gait abnormalities. When walking, many people have their feet rolling in (also called “excessive pronation”). When the foot pronates, the arch structure collapses, which stretches the plantar fascia and places too much stress on the heel bone or the ball of the foot where the plantar fascia is attached to. Over time these tractional forces can result in inflammation of the fascia and surrounding tissue, thus causing pain in the arch, heel or ball of the foot. 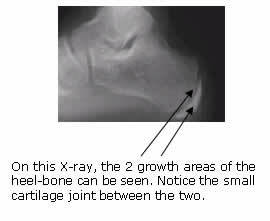 The heel bone may sometimes respond by developing a bony growth in its middle, called “heel spur”. 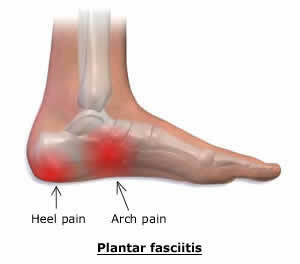 Plantar fasciitis is the forerunner to a heel spur. Plantar fasciitis may be temporarily relieved by anti-inflammatories, but consulting a podiatrist is essential to treat the problem at the root. Plantar fasciitis is best treated by neutralizing abnormal foot pronation with the help of custom orthotics also called “arch supports”. As their name indicates, they will give controlled support to the arch. The amount of support necessary will differ from one person to the other and a podiatrist will be best able to measure the exact amount of support necessary for each individual. In the beginning, when wearing the orthotics, the muscles and ligaments of the feet and whole body need to get used to the new correct position of the feet. To do this smoothly, the wearing time of the orthotics needs to be gradually increased over a 1 week period. Orthotics need to be worn between 75 and 80% of the time when weight bearing to be effective and it will take approximately 3 months for the body to be fully used to the new correct position of the feet. Learn more about orthotics on the orthotics page. Ingrowing toenails happen when a sharp nail, often the big toe nail, grows incorrectly and cuts into the skin. As the nail grows and penetrates deeper into the flesh, an inflammation often occurs, and eventually becomes infected. The skin then appears very red, swollen and tender to the slightest pressure. Ingrown toenails are often caused by ill-fitting footwear, a poor nail-cutting technique, and keeping the feet in wet conditions for too long. Shoes that are too narrow (or too shallow) force the sides of the nail to fold and grow into the toe. Flat-feet (rolling in of the foot) increases the pressure on the toe when walking, so that the nail pushes into the flesh of the toe. Incorrect nail cutting techniques such as nails cut too short allow the nail to embed itself into the protruding soft tissues. Nails cut obliquely around the corners of the nail encourage the nail to embed itself into the grooves on the sides of the nail. If the ingrown toenail is not infected, your podiatrist will remove the part of the nail that is ingrowing with fine nippers. The edge of the nail will then be carefully smoothed with a special file, and the cut flesh will be disinfected and thoroughly dried. From then on, your podiatrist will demonstrate a proper nail cutting technique, and suggest the use of orthotics for a well-positioned foot, as well as properly fitting footwear. Nail surgery may be necessary if in the long term the nail keeps ingrowing, despite conservative treatment. Surgery will consist of painlessly cutting the nail away partially or completely. This is done under local anaesthetic. The offending part of the nail will be carefully cut off, so that the rest of the nail's surface is flat. The podiatrist will then use a chemical solution to kill the part of the nail bed where the ingrowing edge was growing from, so that the nail will not re-grow from there again. The cavity will then be packed and covered with an antiseptic dressing. The patient will now be free to walk out pain-free, relieved, and with a new-found comfort in their feet! Three to four days after the surgery the podiatrist will need to see the patient again to renew the dressing and check the healing progress. Although it will probably be much more comfortable to walk soon after the surgery compared to before, it is necessary to rest the foot as much as possible. For any questions about ingrown toenails, nail cutting, or our treatment procedures, give us a call. Sharp pain in the knee or outside the knee usually occurs during or after excercise. Knee pain often develops because of flat-feet or 'plantar fasciitis'. The misalignment in the foot and ankle causes the knees to turn inwards, which leads to an improper movement of the knee cap. 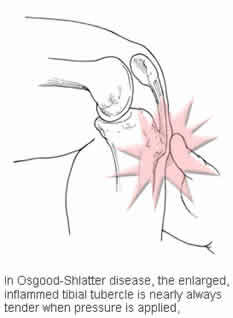 In time, the hurtful position of the joints causes inflammation and pain. Knee pain can be cured by correcting the movement of the knee cap. Your podiatrist will do this by supporting the feet with a type of insole called 'orthotics' into a normal, aligned position, and the re-alignment of upper joints in the leg and pelvis will subsequently follow. Orthotics provide support for the foot at all times and re-align and re-balance the joints of the foot and higher joints of the knee and pelvis into a natural position. Another alternative, depending on the extent of the misalignment, is to wear a knee strap. Consult a FootWise podiatrist about the treatment relevant to your specific condition. The pain itself can be relieved with anti-inflammatories, but the disorder must be treated by a podiatrist to avoid further damage to the knee joints. For any questions about knee pain, orthotics, or our treatment procedures, give us a call. Definition – During walking, the foot rolls in (or pronates) to a certain extent and the arch flattens out to absorb shock when the heel strikes the ground and to assist with balance during mid-stance. This is normal and necessary for the foot to adapt to the ground. Over-pronation though, or excessive rolling in of the foot can be problematic and painful since the arch flattens out too much and soft tissues over-stretch. Joint surfaces then function at unnatural angles to eachother. This can first cause fatigue, and as things worsen will strain the muscles, tendons and ligaments of the foot and lower leg, making them painful. Custom orthotics (also called “arch supports”) are the best way to treat and prevent over-pronation. They are custom-made shoe inserts which will give controlled support to the arch and hence neutralise abnormal foot pronation, maintain good foot alignment, prevent the soft tissues in the foot from stretching and eliminate pain. The amount of support necessary will differ from one person to the other and a podiatrist will be best able to measure the exact amount of support necessary for each individual. Orthotics need to be worn between 75 and 80% of the time when weight bearing, to be effective. Learn more about orthotics on the orthotics page. Plantar warts (or warts affecting the sole of the feet) are one of the most common viral infections of the skin. They are very infectious and can easily be transferred from one person to another in public swimming pools, sports centres and gymnasia. There can be considerable variations in the appearance of plantar warts. In the early stages they may be mistaken for hard corns or small areas of callous, but warts have a much more rapid development than corns and they can occur at any site whereas corns mainly occur on sites of compression and friction. Warts can occur as single or multiple infections (mosaic warts). The mosaic wart tends to be shallow and pain-free while the deep plantar wart can be extremely painful. Normally there is an immunological response of the body to this infection leading to a spontaneous regression of the wart or warts usually within 6 to 8 months of onset. Persistence of the wart beyond this time or pain or disability are indications that an active treatment should be undertaken by a podiatrist. Some people have been shown to have a defect of cell immunity and for them treatment may last longer than usual. Treatment consists in destructive techniques to destroy the virus infected tissue and thus remove the lesion. 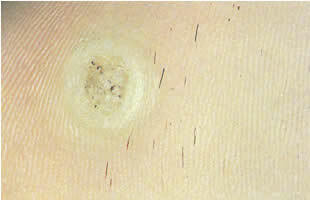 The two main techniques for destroying the wart are chemical and cryosurgical. Chemical cautery: different types of acids can be used by the podiatrist. It is extremely important that the surrounding normal skin be carefully masked so as not to be burned with the acid when applied to the wart which can be best done by a podiatrist. It is essential to see the podiatrist within a week or so for him to gently remove the destroyed tissue under antiseptic conditions. Oer or several further applications of acid may be necessary until the wart becomes necrotic. Cryosurgical technique: with this technique the podiatrist will freeze the wart or warts. The applicator which is held in contact with the skin, reaches a temperature of -55°C. The affected area will turn white and temporary, visible changes in the intensity of pigmentation may occur following treatment. Cryotherapy sometimes gives rise to blisters. Some infections may require a series of fornightly treatments. With cryotherapy the uppermost layer of the skin, together with the infected tissue, will disappear and will be replaced by a new, healthy layer of skin in 10 to 14 days.